Microsoft has courted a fair amount of flack for its decision to stick a touchscreen-friendly interface on the front of its desktop operating system, despite some recent concessions (you can now boot straight to the desktop, for example, of which more below). Don't worry. You can actually use the software pretty well with a good old keyboard and mouse combination—it's just a question of knowing the right shortcuts. Until Microsoft brings back the Start menu, you're going to have to flick back and forth between the desktop and Start screen to get at most of your apps, unless you want to cover your desktop wallpaper with shortcuts. One click in the lower left corner of the display brings up the Start screen; another click brings you straight back to the desktop. Alternatively, tap the Windows key to go back and forth. The Esc key brings you back to whichever app you were just using from the Start screen. If you have Start screen and desktop programs open simultaneously, hover the mouse cursor up in the top left corner to see them, then click on the app you want to switch to. Repeatedly clicking in the top left corner cycles through all of your running apps—in this scenario, the entire desktop environment is considered as one app. Press Windows key+Alt+Tab to bring up the same list of apps, which stays on screen even after the keys are released. The Alt+Tab keyboard shortcut still works, and has the benefit of cycling through all of the open desktop programs individually as well as the Start screen apps. You can also right-click on the Start button (lower left) to shut down the computer or launch various other parts of the operating system (like the Control Panel). On the Start screen, use the Ctrl+Tab keyboard shortcut to switch between the pinned items and the full list of apps. You can right-click on any of the big live tiles to resize, uninstall or unpin them, or to pin a particular application to the desktop taskbar. The same right-click options are available in the full apps list as well, while you can open up the Settings charm to make more changes to the look of the interface. Click and drag icons to rearrange them and right-click on a blank area to name the groups you've created. In most Start screen apps, you can right-click to bring up a menu of options (the equivalent of swiping up from the bottom of a touchscreen). Click-and-drag the top of a Start screen app down to the bottom of the display to close it, or use the reliable old Alt+F4 keyboard shortcut. Since the 8.1 update, these full-screen apps now have a title bar too, so you can also just click the cross icon in the top right corner. Use the title bar to drag an app to either side of the screen to dock it, or hold Windows key+Period (.) and tap the left or right cursor key to achieve the same effect. Like desktop programs, each Start screen app has its own set of keyboard shortcuts, but the majority of apps will let you right-click to bring up menus at the top and bottom—this is usually the way to go if you're confused about what to do next. Press Windows key+C or move the mouse cursor up to the top or bottom right corner to bring up the charms bar, featuring Search, Share, Start, Devices and Settings. You can also access these charms directly: hit Windows key+S to search everywhere (including apps and the Web), or Windows key+F to just look through your files. Speaking of search, with the Start screen on your display you can simply start typing to run a query—you can look through your files, search online or quickly jump to a program installed on the system. Windows key+H brings up the Share charm, Windows key+K opens Devices and Windows key+I is the one to use for Settings. Microsoft introduced a pile of improvements in the latest 8.1 update to make Windows 7 users feel more at home—you can now move the mouse cursor down to the bottom of any Start screen app to show the desktop taskbar, for example. If you want to make the Start screen feel a little bit more like home, you can give it the same wallpaper as your desktop by opening up the Personalize menu (via the Settings charm on the Start screen). You can also boot straight to the desktop if you want to avoid the Start screen altogether—right-click on the taskbar, choose Properties and tick the top option under the Start screen heading. 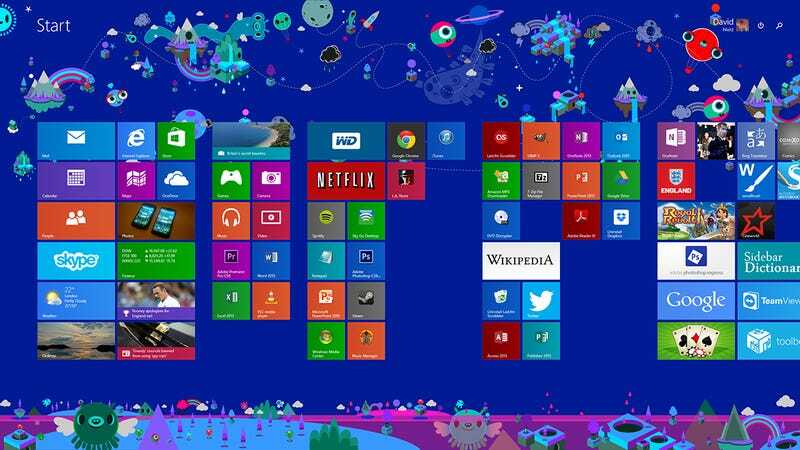 Hopefully, these mouse and keyboard shortcuts should make life a little easier the next time you boot up Windows 8.1. Here's a bonus one: Windows key+PrtScn will save a screengrab inside your Pictures folder. If you still need more shortcuts, Microsoft has an overwhelmingly comprehensive list.